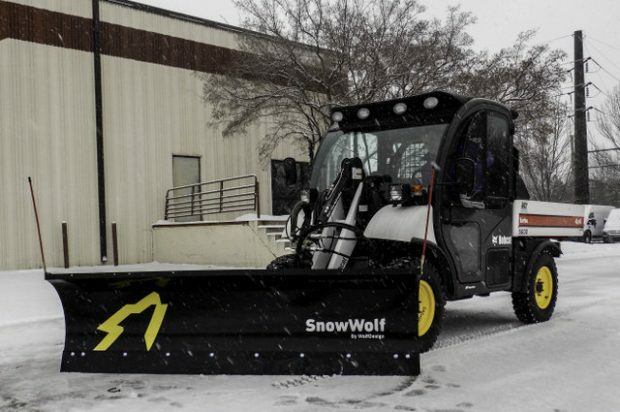 SnowWolf recently introduced its newly redesigned ProPlowFX, an all-purpose plow that works equally well for snow removal and light dirt moving or landscaping. The versatility of the Burnsville, Minn.-based company’s new attachment is made possible by a semi-floating torsion system that provides infinitely variable down pressure and shock absorption, a trip-lock-out feature and a shorter blade-to-machine distance for greater maneuverability. The ProPlowFX also features automatic oscillation, which is an improvement over the previous design. It allows the attachment to rise or fall up to 5 inches on either end so the plow follows the contours of the surface being plowed and scrapes it clean. In addition, SnowWolf resized the blade to make the ProPlowFX ideal for smaller skid steers and compact tractors. The attachment is designed for use with machines that weigh up to 8,000 pounds, and it is available in 5-foot, 6-foot, 7-foot and 8-foot lengths. Holman said that nothing like the ProPlowFX’s patent-pending torsion system has ever been used before in snow removal attachments. The greatest benefit of the semi-floating torsion system, he said, is that it allows the operator to apply variable down pressure from zero to full down pressure on the blade. When an operator rolls the attachment plate forward or backward, the system either exerts down pressure or releases pressure from the blade’s cutting edge. The farther forward an operator rotates the attachment plate, the more down pressure he exerts on the blade’s edge. Eventually the system gets so stiff that it applies full down pressure and the skid steer’s wheels lift off of the ground. To ease pressure, the operator rotates the attachment plate back toward the skid steer or tractor. The torsion system also flexes to provide cushioning in the event of an obstacle strike while plowing snow or moving other material. Finally, the system provides built-in shock absorption when traveling between projects. Rather than bouncing metal to metal on a solid or chain lift mechanism, which are common in other attachments, the ProPlowFX’s weight rests on the torsion system. If an operator hits a pothole, for example, the plow will be cushioned and bounce slightly rather than delivering a jolt to the operator and machine. A plow’s trip feature is essential when plowing snow because there are often obstacles hidden under the snow. The trip edge protects the operator and the machine by minimizing or completely alleviating the force the jolt. However, when moving dirt or other materials, the trip function can hinder the plow’s efficiency or even make it impossible to complete the job because the blade will trip every time it encounters an obstacle or there is too much weight from material in front of the plow. The redesigned ProPlowFX allows an operator to lock the trip mechanism simply by adding two bolts between the blade and the quadrant interface. Holman said the re-design came in response to suggestions from customers in southern areas of the United States. Many compact tractors have mounting plates that are far away from the front of the tires, as much as 3 feet in some cases. When a long attachment is added to the front, it adds tension to the machine’s components and affects the tractor’s maneuverability. SnowWolf designed the new ProPlowFX with compact tractors in mind by shortening the distance from the cutting edge to the back of the attachment, making it 9-1/4 inches shorter than the previous version. The adjustment makes for a tighter turn radius, provides better overall maneuverability and reduces stress on the tractor’s components. SnowWolf also reduced the height of the blade by 2-1/2 inches, from 30 inches tall to 27-1/2 inches. Holman said the new ProPlowFX is “better sized” for small skid steers and compact tractors and it’s easier for an operator to see over the top. “It’s a bit more compact, but it hasn’t lost any strength compared to the previous design,” he said. 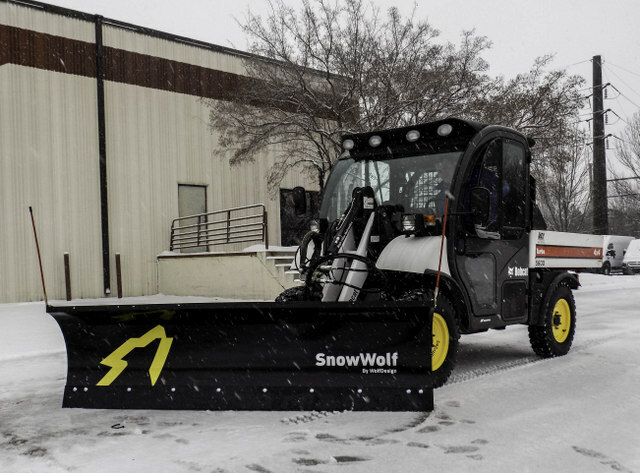 The ProPlowFX also incorporates many standard SnowWolf plow features. For example, the moldboard has an aggressive curvature to enable “live” snow rolling for exceptional efficiency, and the plow angles 35 degrees, which is more than the standard 25- to 30-degree angle of other plows. 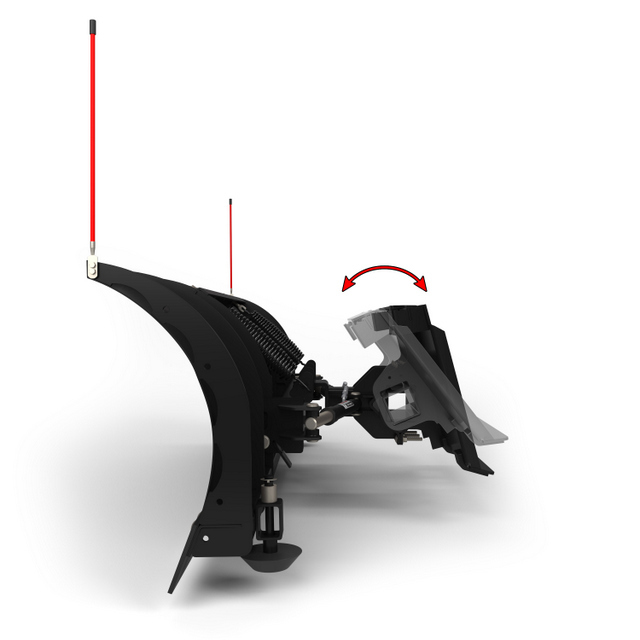 The combination of the optimized curvature and greater angling enhance performance so an operator can plow snow much faster with less trail off on the leading edge of the blade when angle plowing. The ProPlowFX is backed by a two-year warranty. For more info on SnowWolf plow, plow right through this link. Do it!